The title, “Colored Chieftains”, is in a scrolled banner held by the beak of an eagle which unfurls two profiles, Professor R.G. Greener, LLD., Washington DC., and Rev. J.C. price, AM, N. Carolina. 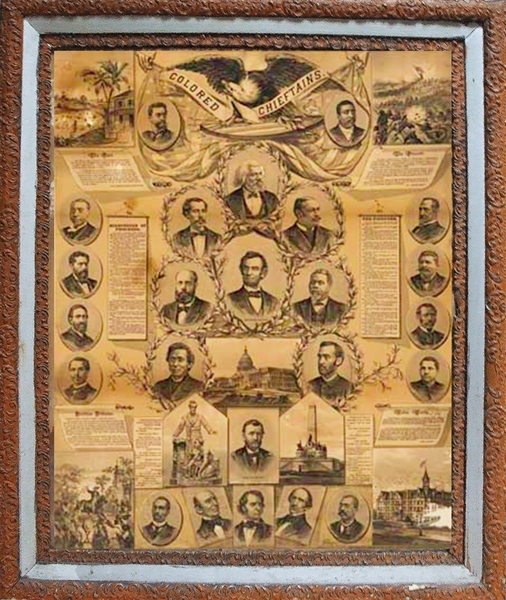 in the center of the print are the larger profiles of Douglass, Lincoln, Bruce, Smalls and four others. There are 15 other named profiles of noted African Americans. Then, there are six printed scrolls; The Past, with engraved cotton field; The Present with an engraved image of Black soldiers; Miles Stones of Progress;The Pioneers, provides backgrounds of the named profiled gentlemen; Peerless Tributes; and Noble Words. Each corner has a large engraved image of important events in the long struggle toward freedom and equality. Cleveland, Ohio: George M. Rewell, 1885. Overall the print is tanned, with lower left showing 3” damp stain. Presented in it’s original frame, wood panel backing. Last example we found sold in NYC for $7200.